Rigorous courses with first-rate faculty in a setting so perfect that no designer could create it--that's the magic of Perry-Mansfield. Since 1913, Perry-Mansfield has been transforming the lives of aspiring young artists and equestrians. 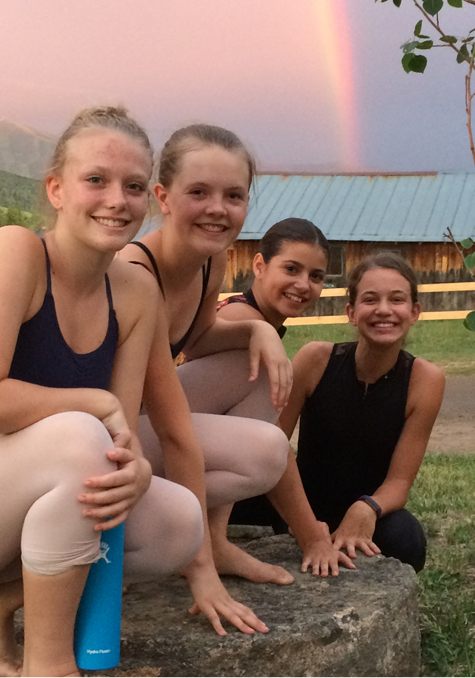 Follow in the footsteps of the nation's finest dancers, and spend a summer that will change your life forever! The opportunity to be featured in multiple original dance works, to study with the finest professional dancers and choreographers across a broad spectrum of dance styles – all in the most spectacular and inspiring setting imaginable. With a faculty to student ratio of 8:1, dancers receive unparalleled personal attention and reach incredible levels of achievement! Esteemed faculty, multidisciplinary study including both theatre and musical theatre, multiple performances, and a range of electives to compliment student training - theatre at Perry-Mansfield is nationally acclaimed. Beginning, intermediate, and advanced riders alike develop skills and confidence at Perry-Mansfield. Traditional equitation, jumping, and horse care skills are featured in our distinguished English riding program. Perry-Mansfield is truly somewhere over the rainbow! Dance, act, and have fun in our fairytale setting nestled in the majestic Rockies. College students apply! During this two-week session,you'll experience life in a professional company setting working alongside a nationally recognized dance company. A world-class education. Esteemed faculty. Dance, Theatre, Equestrian, Performing Arts. Perry-Mansfield Performing Arts School and Camp awaits your application! Perry-Mansfield trains dancers to be disciplined, dedicated, and intelligent movers and allows them to explore the freedom that is needed to be an artist. Perry-Mansfield trains students to be focused, self-confident, and skilled actors and allows them to explore the freedom that is needed to be an artist. A premiere arts training program for students ages 10 to 12, this residential program combines all Perry-Mansfield arts programs in one amazing two-week session. A combination of multidisciplinary arts training and traditional camp activities in a fun and unforgettable day camp for students ages 8 to 10. Whether you are a beginning or more experienced rider, Perry-Mansfield’s equestrian day camp will develop your equitation, jumping, and horse care skills. Spaces for Summer 2018 are limited! Sign up for Perry-Mansfield’s free newsletter “PineBark” and stay up-to-date on all the latest Perry-Mansfield news, alumni updates, and performances!